one hair at a time"
From New York City to the Forks, North Shore to the South Shore, Long Island is a fantastic place to live. That’s why there are about 7.5 million of us here according to population estimates. With all these people here it’s tough getting around. Long Islanders know convenience is important, whether it’s having stores and restaurants nearby or other services. For Long Islanders, looking for a life changing hair restoration treatment that will give them a permanent solution to hair loss, there’s a procedure available that couldn’t be more convenient. It’s called the ARTAS® System and it’s only available on Long Island with RHRLI. The ARTAS® System uses robotic technology to create a minimally invasive hair transplant. Your doctor will use a robotic arm that will harvest healthy donor hairs and transplant them to the areas of the scalp where they’re needed. In a few months, you will have a healthy new head of hair. All of our procedures are done in the comfort of our Jericho offices. We want to tell you about the convenience of our offices and our life changing solution to hair loss. Brooklyn and Queens may be part of New York City, but that doesn’t mean that you have to haul yourself to Manhattan or elsewhere to undergo the ARTAS® procedure. The drive from Brooklyn is only 30 to 40 minutes away. It’s even less from many parts of Queens. From Brooklyn, you can take the Jackie Robinson Parkway to the Grand Central Parkway and continue east on the Northern State Parkway. Take exit 35S for New York 107 S toward Hicksville and merge onto N Broadway. Our offices are at 366 N. Broadway. From Queens and the Long Island Expressway to exit 41S toward NY-106 S/NY 107 S toward Hicksville. Merge onto S Marginal Rd, and use the right 2 lanes to turn right onto N Broadway. We’re also convenient to the Hicksville LIRR station. Just travel north on Broadway and you’ll be there. Of course, RHRLI serves Nassau County and Suffolk County as well and our Jericho office is centrally located. We make it convenient for you by allowing you to take care of all your hair loss treatment in the comfort of our state-of-the art-offices. You can have your initial consultation there and our facility will also be the site of your procedure. All of our transplants are done by our Board-Certified surgeon, Dr. Baiju Gohil, and our staff will do everything we can to make you as comfortable as possible. There will be opportunities for breaks and you will have the opportunity to listen to music during the procedure. Perhaps the most convenient part of having the ARTAS® procedure with RHRLI is that the procedure is non-invasive. Unlike other procedures such as “strip surgery,” ARTAS® doesn’t leave an ugly scar and you won’t have to take prescription pain medication for weeks. Most ARTAS® patients are back to their regular life in just a few days. If you want to do something about your hair loss, there’s never been a better time. 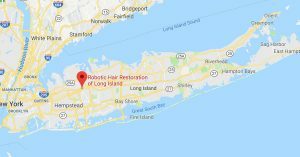 And if you live on any part of Long Island there’s never been a better way to change your life with a permanent hair loss solution than with RHRLI and ARTAS®. To learn more, contact us today. Previous Post: « Will My Hair Transplant Be Pain-Free? Get a free consultation from one of our hair restoration experts today! Learn more about our virtual pain free and scar free system! returned the next business day.